50 years young! 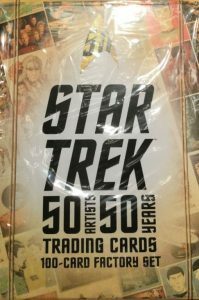 It may be hard to believe that it has been that long but 2016 Rittenhouse Star Trek 50 for 50 offers a basic overview of the storied franchise with images taken directly from commissioned art pieces. The factory set is not limited to one specific series, however, and instead touches on many points in the history of Star Trek, including both television and movies. The 100-card set came about as a celebration of the commissioned pieces by CBS in honor of the golden anniversary. Composed entirely of base cards, the factory release documents notable moments as well as different interpretations of main characters from 50 different artists. This, of course, is in reference to the 50 years of Star Trek. Some of the depicted artwork features a multi-card, puzzle format with as many as nine cards dedicated to one piece. 2016 Rittenhouse Star Trek 50 for 50 first debuted as a limited release at 2016 San Diego Comic-Con through the Official Star Trek Shop booth. This was later expanded to a larger offering from Rittenhouse. The full Star Trek sets retail for $50. Collectors can also view and purchase prints for the artwork showcased in the factory set. Check out the full gallery at Star Trek's art exhibition in honor of the 50th anniversary. A previous 2016 release from Rittenhouse concentrated specifically on Star Trek: The Original Series with a 50th anniversary theme. 2002 Inkworks JJ Abrams Autograph Auto Card A2 Star Wars Star Trek Alias!!! Women of Star Trek 2010 Autograph Elizabeth Dennehy!